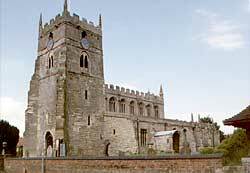 All Saints, Sutton-on-Trent, was sympathetically restored by Willam Weir in 1902-3. The tower contains Saxon foundations and Norman herringbone work: the upper stages are 13th and early 14th century respectively (A. Nicholson, 2001). Sutton-upon-Trent, a populous place, is famous for having given its name to one of the oldest and most influential of our local familiesa family that gave Earls to Warwick and Leicester, and Lords to Lexington and Dudley. On the opposite side of the river is Meering, where the Trent originally formed a mere or lake, from which the name of the village is derived. This place also gave its name to a noted family, some of whom received the honour of knighthood, and intermarried with the Markhams, the Hercys of Grove, and members of other powerful houses in the vicinity. In Sutton Church is some carved stone screen-work, ornamented with the arms of the Meerings. From Sutton we pass on to Grassthorpe through a level tract of country, over which the river at times, after a heavy rainfall, makes considerable encroachments. The village is small, and possesses nothing worthy of note; but it seems to have once had a chapel founded in honour of St. James. When the sacred building became ruinous it was converted into a cottage and barn, and granted by good Queen Bess to Alexander Rigby and Percival Gunstone, gentlemen. Grassthorpe had several centuries before this period formed part of the possessions of the lordly family of Furnival, and it had also recognised as its landlord no less prominent a personage than Michael de la Pole, Chancellor and Keeper of the Great Seal and Earl of Suffolk. The eminent and worthy family of Chaworth owned the manor of Marnham for several centuries, and Sir Thomas Chaworth (24th Henry VI.) obtained a grant of a yearly fair for two days, which continues to be kept. Henry de Lexington, Bishop of Lincoln, held the fourth part of a knights fee in Marnham, of Richard de Weston, for a pound of pepper yearly, and Robert de Markham had some property here of a like tenure. The rectory was held by the Preceptory of Eagle, being part of the possessions of the Knights Hospitallers, but was granted, with the lands and meadows connected therewith, by Henry VIII. to Thomas Babington. In the reign of Queen Elizabeth Anthony Babington had the property, but, being attaint for his complicity with Mary Queen of Scots, the estate passed into other hands. 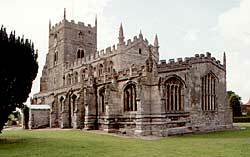 The church and parsonage are in the centre of the village, and the sacred edifice has been carefully restored. There are numerous memorials to the Cartwright family, members of which were soldiers, politicians, and travellers of wide celebrity. Some of them were endowed with literary ability, and one Edmund, who was in holy orders, attracted considerable attention for his inventions of curious machinerynotably for the weaving of cotton, for which Parliament made him a substantial grant. The Mering Chapel dates from c.1525 and is the most splendid part of the church. The exterior of the chapel includes "panelled battlements, buttresses with crocketed pinnacles, wide 16th century windows and gargoyles and faces everywhere."